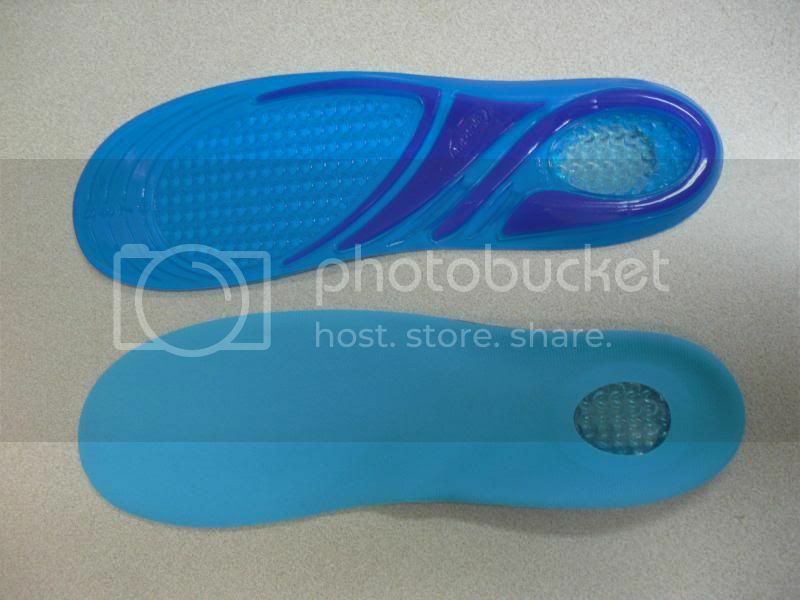 As a BzzAgent I had the chance to try Dr. Scholl’s® Massaging Gel® Insoles for free. Because I have Fibromyalgia I am always looking for products that will help reduce pain or help me stay pain free. My feet start to hurt pretty quickly when I’m on them without consistent breaks. This is especially true when I’m on hard surfaces. Unfortunately, our house has all linoleum flooring, so I’m walking on hard surfaces all day. Although I try to sit down often there are days where I’m also on my feet a lot when we’re having a more hands-on type school day, and those days really take a toll on me. I’ve never tried insoles prior to this Bzz Campaign, but I do own a pair of Dr. Scholl’s shoes that I like, so I was excited to try the insoles and use them in any pair of shoes I choose. So, I chose my Grover tennis shoes because I love them (how can you NOT love shoes with Grover on them? ), but my feet slide around in them, and they’re just not very comfortable to wear after a while. 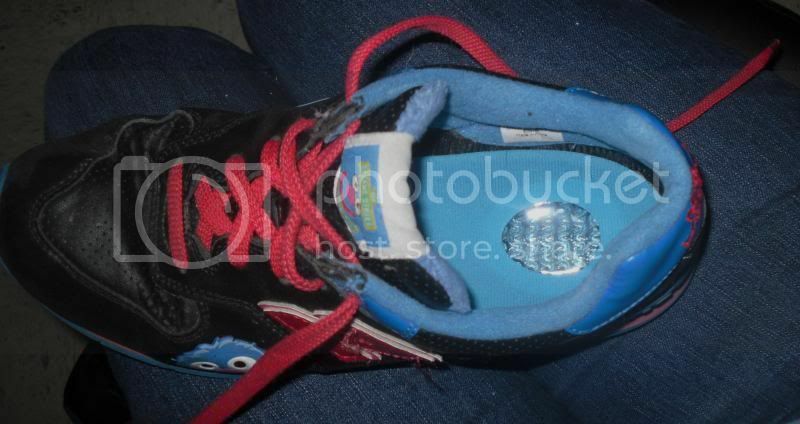 So I cut the insoles to the correct size, which I found very easy to do, and put them in. I did have to unlace the shoes to put the insoles in, but I do also have poor fine-motor coordination, so it may be possible to put the insoles in without unlacing the shoes with better fine-motor coordination. Voila! Look! They even match! They fit in my shoes nicely, and I haven’t had any issues with sliding, slipping, or bunching. One of my fears with insoles was that they would come out when I take my shoes off, but I’m happy to say that doesn’t happen. Also, my feet don’t slide around in these shoes anymore, which is really nice. The main areas where I notice pain are the balls of my feet and my heels, and the insoles have made a major difference! Not only have I noticed my feet aren’t hurting like usual, but the insoles actually feel nice to walk on. I truly can feel a difference. I am really happy with the Dr. Scholl’s® Massaging Gel® Insoles and happy that I can enjoy my favorite tennis shoes again! Take the Extra Step Challenge through 6/23! Are you ready to feel the difference? Buy a pair of Dr. Scholl’s insoles today and get a reward (values ranging from $5-$40). Choose from rewards such as an amusement park pass, dance lessons, two for one golf and more! Visit the Extra Step Challenge for more information. I love the Dr. Scholl’s insoles – so comfy!! I just got the high heel ones – LOVE them! I might have to try them! The only reason I don’t wear high heels is because they hurt my feet! I have to share that my husband finally bought some of these for his work shoes…and I am so grateful! No more lower back pain for him which means no more back massage requests for me! I love Dr. Scholl’s and not even for MY feet! lol Your Grover Tennis Shoes are awesome!! My fiance had some of these Dr. Scholl’s inserts not to long ago! He liked them too! My mom uses in soles since she had a hip replace and dr scholls works great I never thought about it helping someone with Fibromyalgia my friend has that and I am going to talk her into trying them to see if they help her. Lol .i got these too from buzzAgent. I can relate to pain ,I have diabetic nerve pain and tendon feet problems. They worked pretty good for me to. My husband has chemotherapy induced neuropathy, and I told him I think they would help his feet, too! I’m glad to hear they help the nerve pain!